So said Ralph Waldo Emerson. I wholeheartedly agree with this idea, but I’m pretty sure Ralph never spent the night in one of these truly unique destination hotels or he just might have changed his tune. Sometimes the destination is worth the journey…especially when you are sleeping with the birds 40 feet above the ground or under a star-filled sky in the Utah desert in a trailer that could have been used by Harrison Ford while on location for Indiana Jones. What’s not to love about the Shooting Star Drive-In & Airstream Park. This place is a baby boomer paradise! 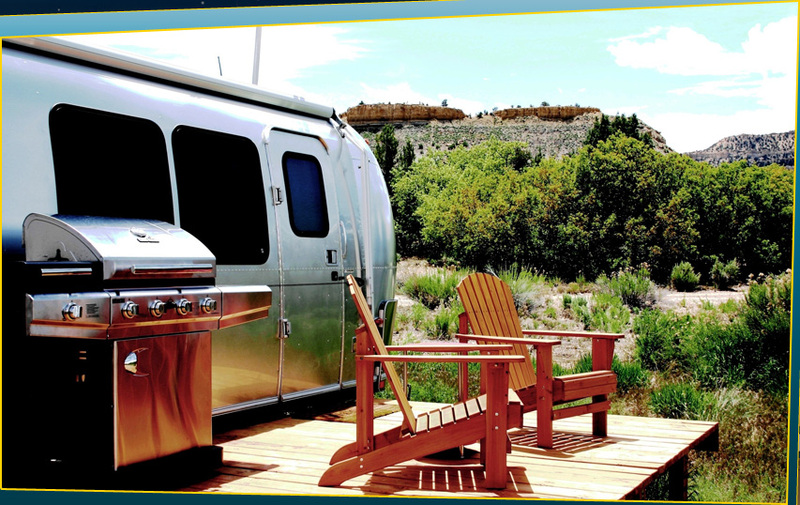 Owner Mark Gudenas, married his three passions – Drive-ins, shooting movies and Airstream trailers to create this unique vacation spot near Escalante, Utah. Mark’s mission is “to provide our guests with a fun, unique and luxuriously comfortable vacation experience in one of the most scenic places in the world”. The campground boasts eight custom designed and luxuriously equipped airstream trailers that pose as Hollywood star’s dressing trailers. With names like “Ann’s Cabana” The Kid’s Hideout, Cary’s Cabin and The Duke, you’ve got some very interesting options for a fun night or two. At dusk you can just slip into a 1964 red Cadillac convertible, one of the many great convertibles provided for your movie-viewing pleasure at the Shooting Star Drive-in. Pass the popcorn! Next stop? 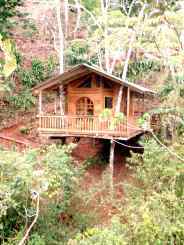 How about a night in a tree house? No kidding. And there several right here in my own Pacific NW backyard, but the Treehouse Treesort caught my attention a while back. If you’re looking for back to nature at it’s most quirky, here it is. This place is loaded with very rustic charm and comes with a great story of one man’s ingenuity, perseverance and love of trees. It’s definitely a backpack only place. One of the cabins circles a Douglas Fir 47 feet off the ground. You have to walk a swing bridge to get to your room and use a pulley system to deliver your luggage. It’s not for the feint of heart or those with a fear of heights, but it would be a great adventure next summer when my granddaughter comes to visit again. (hint!). First of all, who wouldn’t want to visit a town called Nice? Add to that, the opportunity to sleep in a lovingly restored antique railroad caboose and I’m pretty sure we will have to add the Featherbed Railroad Bed & Breakfast Resort to our travel bucket list. Located on Clear Lake in (yes) Nice, CA, each of the nine cabooses has a different theme. You can spend the night in La Loose Caboose, Orient Express, Lover’s Caboose or perhaps the Easy Rider which boasts motorcycle handlebars on the headboard and a fringed-leather easy chair. The grounds are lovely, there is a dock and lake access, feather beds, and a gathering spot in the historic Main Station that’s “a comfortable place to sit and watch nothing happen”. And last on this list, but certainly not least – here’s your chance to sleep in an airplane – comfortably. In 2009, some wild and crazy folks opened Hotel Arlanda, a hotel/hostel in a 747 jumbo jet that is parked at the Arlanda Airport in Stockholm, Sweden. There are 27 rooms, flat screen TV, internet, bathroom/showers down the hall (let’s hope they’re bigger than the standard airplane bathrooms) and a lounge. 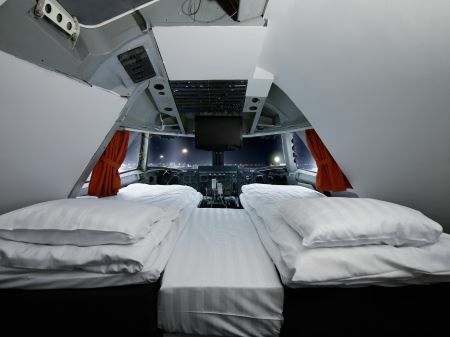 For the real enthusiast, they offer you the chance to “sleep like a pilot”. The cockpit has been converted into a deluxe suite where you can lie in bed and watch the air traffic over the Arlanda airport. You might need noise cancelling headphones if you actually wanted to sleep, but it would be fun. Ok, now I’m worried. Do the pilots really sleep up there? Is that why they lock the door? So they can turn down the beds and turn in for the night? Makes you wonder doesn’t it? This entry was posted in My Musings and tagged boomer travel, cheap travel, justabackbackandarollie, living the good life, off the beaten path, retirement travel, travel desitnations, unique hotels by justabackpackandarollie. Bookmark the permalink. The Airstream park looks wonderful! I agree! I’m going to try to put this place on our travel place for this fall. A fun drive from Portland. I’ll post again from personal experience on this place. The treehouses seem interesting—unless there’s a storm with lightning. I agree Suzanne. They are a little rustic as well. I’m not sure about climbing down 47 feet to use the bathroom during the night! What fun places to stay off the beaten path, Nancy! I’d love to stay in any one of them. Thanks for sharing with us here. I agree Nancy. I just love the creative spirit of the folks who create these interesting places. Patricia. You might like to try glamping. It is luxury camping (glamor + camping). Real beds, good linens, floors, decor. My days of sleeping on the ground are long past. Fun places, Nancy! I love the idea of staying some place different. Looking forward to your personal adventure story in the Airsteam – coming soon! Thanks Lois. Staying in the airstream would be a shakedown cruise of sorts to see if we could actually function (read that sleep on my part) in close quarters. I’ll need really good earplugs!